The finest raw pumpkin seeds, operating undercover in smooth, thick raw chocolate. 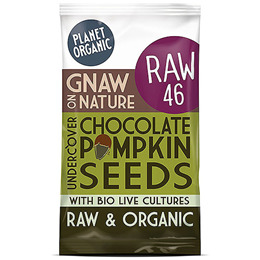 With added bio-live cultures in the antioxidant-rich chocolate to keep you feeling tip top. When Planet Organic opened their doors in 1995, it was their dream to offer the best and widest range of organic foods available. Their mission is to promote health in the community and to bring a sense of discovery and adventure into food shopping. Organic Raw Chocolate 65% (Cacao Solids 71%, Coconut Palm Sugar, Vanilla Powder, Bacillus Coagulans* GBI: 30 6086), Pumpkin Seeds 35%. Produced in a facility that processes peanuts, tree nuts, milk, gluten. 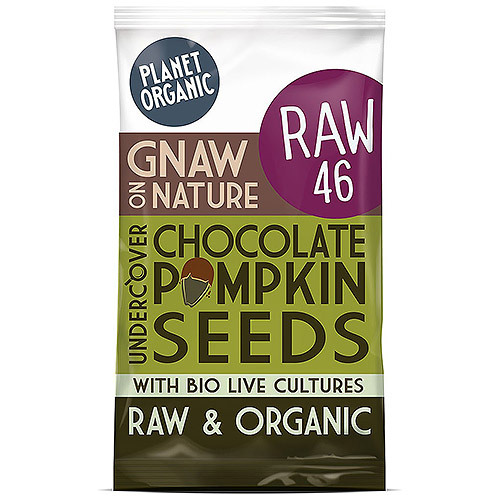 Below are reviews of Planet Organic Undercover Chocolate Pumpkin Seeds - 40g by bodykind customers. If you have tried this product we'd love to hear what you think so please leave a review.